When his wife was diagnosed with TMJ (temporomandibular joint) problems and needed surgery, the oral surgeon told Randy Wilson that his wife would need to eat soft foods for six months. The author took this as a challenge and developed 200 meals that were soft, appealing and nutritious. The self-published version of the book sold 33,000 copies. It has been endorsed by oral surgeons, exhibited at conventions of the National Oral Surgeons, the American Dental Association, and the Registered Dietitians Association. Many medical professionals use the book in their daily practice, and the author now wants to reach a larger audience. The book contains helpful hints, a foreword by an oral surgeon, and a chapter by a registered dietitian. It is spiral bound so it will lie flat while you are cooking. It is not a liquid diet book, nor is it a blender cookbook. The recipes all have nutritional analyses. The book offers new and creative ways to prepare food for the person on a soft food diet. The rest of the family will also enjoy these recipes. The I- Can't- Chew Cookbook: Delicious Soft Diet Recipes for People with Chewing, Swallowing, and Dry Mouth Disorders by J. Randy Wilson was published by Hunter House Publishers in August 2003 and is our 11298th best seller. 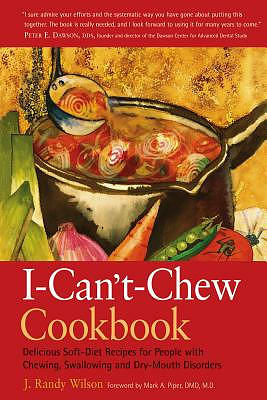 The ISBN for The I- Can't- Chew Cookbook: Delicious Soft Diet Recipes for People with Chewing, Swallowing, and Dry Mouth Disorders is 9780897934008. Be the first to review The I- Can't- Chew Cookbook: Delicious Soft Diet Recipes for People with Chewing, Swallowing, and Dry Mouth Disorders! Got a question? No problem! Just click here to ask us about The I- Can't- Chew Cookbook: Delicious Soft Diet Recipes for People with Chewing, Swallowing, and Dry Mouth Disorders.